If you want to build a home server, it may be advised to actually use server-grade components. 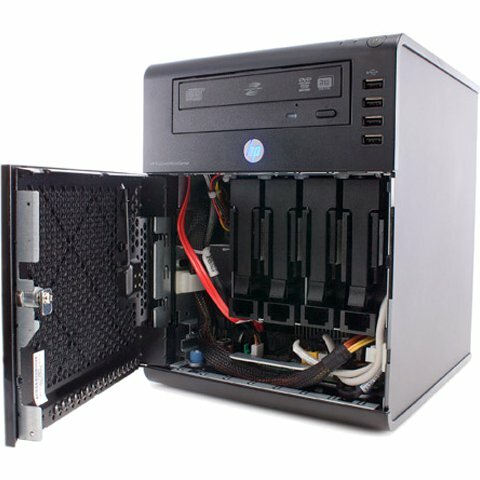 I documented the reasons for choosing server-grade hardware already in an earlier post on this topic. It is recommended to read the old post first. In this new post, I only show new hardware that could also be chosen as a more modern hardware option. My original post dates back to December 2013 and centers around the popular X9SCM-F which is based on the LGA 1155 socket. Please note that the X9SCM-F / LGA 1155 based solution may be cheaper if you want the Xeon processor. So I'd like to introduce two Supermicro motherboards that may be of interest. This board is one of the cheapest Supermicro boards you can get and it has 3 x PCI-e, which may be of interest if you need to install extra HBA's or RAID cards, SAS expanders and/or network controllers. This board is about $80 or €90 more expensive than the X10SLL-F but in return, you get eight extra SAS/SATA ports, for a total of 14 SATA ports. With 4 TB drives, this would give you 56 TB of raw storage capacity. This motherboard provides a cheaper solution than an add-on HBA card, which would occupy a PCIe slot. Hoever, the's a caveat: this board has 'only' two PCIe slots. But there's still room for an additional quad-port or 10 Gbe NIC and an extra HBA if required. Dollars are from Newegg, Euro's are from Tweakers.net. Update 2012-12-11: It seems that a new and faster version is on the horizon. Update 2012-12-21: Yes, the new model G7 N54L is out. 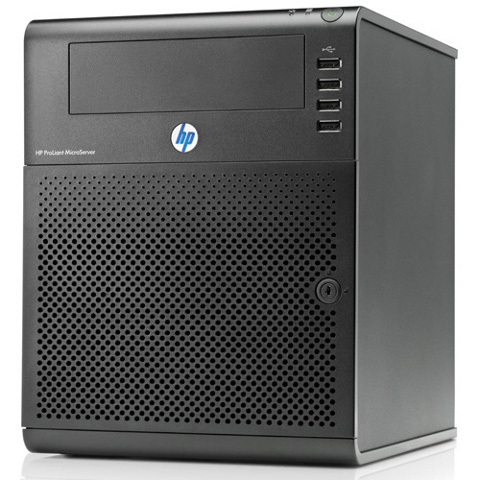 Some products seem almost too good to be true and I think the HP Proliant Microserver N40L is one of them. If you are into the market for a very small, silent, efficient, yet capable home server, please take this device into consideration. I picked this device up for 200 euro's which is a bargain in my opinion. First, take a look. As you can determine from the size of the 5 1/4 inch bay, this device is really small. The fun thing is though, that behind that door is room for four 3.5 inch SATA hard drives. So you can put four large SATA disks into this device. It is just ideal as a home NAS, without resorting to expensive QNAP or Synology devices, which may not give you the flexibility you want. The on-board RAID controller only seems to support RAID 0 and RAID 1. If you want to make a NAS out of this device you want to go for RAID 5. So you have two options. Use Linux or BSD software RAID and don't spend a dime. It contains the AMD equivalent of Intel's Atom processor, the Turion II Neo N40L dual-core, which runs at 1.5 Ghz. This CPU is not fast, but it is energy efficient and it helps keeping the device silent and cheap. The device contains just 2 GB of ECC RAM. Sufficient for most tasks, but you can crank it up to 8 GB. The fact that you get ECC RAM in this device is a real plus, making this device extra reliable. By default, a 250 GB disks is included. How they do that for this money is something I don't get. This disk takes up one of the four drive bays. 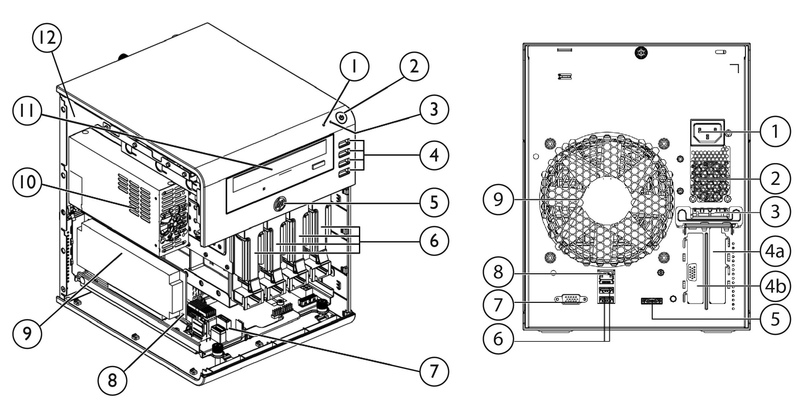 Personally, I would not use the 5 1/4 slot for an optical drive, (who uses them anyway in a server), instead, I would look into a solution where you can put the stock drive into that space, to make room for an additional disk for file storage. Useful in case you are building a NAS. You may even install additional 2.5" disks with solutions like this. The microserver has two half-height PCIe slots, one x16 and one x1. It has also an esata connector at the back, so you can connect an external disks for backups or something. There are two USB ports at the back, four at the front. I wish they put four at the back and two at the front. The device is very economic, I estimate power consumption at about 25 watt when idle. I measured 35 watt through my UPS, but there where also two external disk drives and a network switch connected to the UPS. Noise levels are also excelent. There are just two fans. One very large fan at the back, that just seem to cool the entire device. The second fan is housed inside the tiny power supply, but although it is small, the fan makes little noise. When it is idle, you don't hear this server running. I was able to install Ubuntu 12.04 LTS out-of-the-box. Is running fine. I didn't test any other operating systems. I wanted to replace my Linux router (an old Mac Mini) with a device that can house two disk drives, so I could implement RAID 1. I use it as a Router/Firewall. But I also run a website on it, some monitoring software, so that's why I didn't want to buy a regular Linksys or Zytel embedded router. Although this server has only one network interface, I use VLAN tagging with a VLAN-capable switch, so this is not a problem. Otherwise, I would just add a second Gigabyte half-height PCIe NIC. It's an ideal device for any computer enthousiast who wants more flexibility than a standard NAS or embedded router can offer. It's cheap, small, silent and power efficient. Those HP engineers who created this device should get a thumbs up. When deciding on which computer to buy, the first decision you have to make is about whether to go for a desktop or a laptop. There was a time that many believed that the desktop would become a niche product. Most people want a laptop because they can take their computer everywhere they want to. Or at least lie on the couch while surfing. If you want a laptop that also must replace your desktop, it must have a good screen, be fast and have lots of storage. And laptops are so good these days, they can be desktop replacements. Even if you buy a small laptop, they can still be fast and when necessary, you just hook up an external display, mouse and keyboard. This is how I worked for many years and I still do. But I consider switching back to a desktop-based computer. I have two computers. The first one is an Intel-based Macbook (black) mid-2007, which is my main computer. The second one is a custom-build PC running Windows, solely for the purpose of gaming. This PC is based on Intel's Core i7 920, with 6 GB of RAM, so it's quite fast, even for today standards. Both Macbook and PC are connected to a DVI KVM switch, that allows me to switch the keyboard, video and mouse between those systems. They thus both share my EIZO 24" (1920x1200) screen, keyboard and mouse. Apart from these systems, I own an iPhone and an iPad. For the last half year, I started to get annoyed with my Macbook. It just got slow. I put in a faster hard drive, but to no avail. The Macbook wasn't responsive enough. So I started thinking about replacing my Macbook. The first thing I realised that I do not need a laptop. I have an iPhone and an iPad, so sending emails, reading web pages, no problem. I do not tend to work on my Macbook outside of my house. So I don't think I need the mobility of a laptop. I want a fast but quiet, affordable computer attached to a high-resolution screen. If you are a Mac user, there are three options: an Mac mini, an iMac or a Mac pro. I consider the Mac mini to low on specs and the Mac pro is just way too expensive. That leaves the option of an iMac. Since I love high-resolution displays, the iMac 27" does appeal to me very much. The screen is just gorgeous. And you can put an Intel Core i7 into it, so it can be fast too. Even the video card is decent enough to play most games, either on Mac OS X or on Windows using Bootcamp. Then after a discussion with a friend, I realised that the iMac would replace my PC. And my EIZO screen. New iMacs will probably arrive this summer, sporting even better processors, video cards, probably Thunderbolt. So I think I've made up my mind. I would still have my 'old' Macbook if I really needed any mobility. But I expect that once I have an iMac, both my PC and my Macbook are better off in the hands of somebody else. And I will need the money, an iMac is not cheap. Thinking about this all led me to believe that in general, I would rather go for a setup with an iMac and a very thin plus lightweight laptop like the Macbook Air, than to buy a chunky desktop-replacing laptop like a Macbook pro. The big advantage of the latter is that you always have all your stuff with you. But you pay a price. The first thing is the weight. I really dislike the weight of my Macbook at 2+ kilos. The second thing is the fact that you always have to (dis)connect all these cables every time you switch between "desktop mode" and "laptop mode". The third thing is the noise. When putting some strain on the processor and/or video card, laptops tend to get noisy. A desktop can give you true performance while still keeping things quiet and provide you with ample screen real estate. A netbook-like device such as the Macbook Air can give you true portability. I won't buy a Macbook Air, but this would be a really nice setup. The only thing you need to fix is the syncing problem. But there are services like Dropbox that may help you with that. My PC has an Intel X25-M Postville 160 GB SSD installed as a fast boot disk. Since I couldn't stand the unresponsiveness of my Macbook anymore, I decided to put this SSD into my Macbook. This is cheaper than buying a new mac and I want to wait for that until the new iMac models arrive. Installing the SSD made my Macbook come alive again. The Macbook only sports a SATA 150 interface, but it's not about throughput. It's about random IO performance. I am very happy with the result, there is less of an urgent 'need' to replace the Macbook in the near future. I can wait calmly on the new iMacs and decide then what I want. There is also this podcast where John Gruber of Daring Fireball is telling about is his purchase of a Macbook Air and suggesting that he will replace his Macbook Pro 15" with an iMac eventually.